Bill Berry always looked good in a vest. 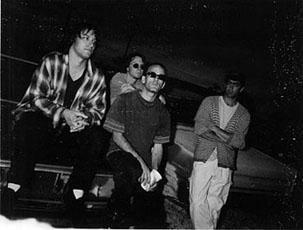 All photos on this post are from the official R.E.M. website. We define parts of ourselves – we build our selves – with the bricks and mortar of music, movies, labels and gadgets. They shade our personality and accessorize our history, like grade school ornaments on a Christmas tree. The first time I used a tiny-screened boxy Apple was in a friend’s dorm room. What was the movie you-popped-in-to-the-VCR-with-microwave-popcorn-after-a-late-night-out? I had two: Valley Girl and The Sure Thing. “Something light!” Which band have you seen in concert the most? 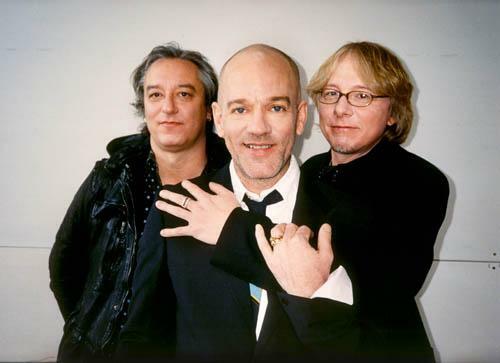 If ever there was a band that wove itself in to the fabric of my life, it was R.E.M. Still is. And not just in a nostalgic, wasn’t-it-great-to-be-young kind of way (I leave that to Duran Duran and Depeche Mode), but in a living, breathing infusing-my-life-with-deeper-meaning kind of way. Now, as a group, the boys from Athens are no more. Jefferson I think we’re lost! My oldest brother, on holiday from university, brought home Reckoning when I was seventeen. I put the album on my Magnavox stereo, which I’d inherited from my other brother, and tried to make sense of a sound I’d never heard before. So different, so new, so absolutely, completely different from anything out there. Then I went off to college and my sister and I, now roommates, listened over and over to the earthy dreams of Fables of the Reconstruction. We went back to discover Murmur and Chronic Town and marveled at a band that used words like ‘Moral Kiosk’ and made music as shy and beautiful as ‘Perfect Circle’. My first R.E.M. concert was on the Life’s Rich Pageant tour. Appropriately enough my oldest brother and sister were there too, all of us on that night right where we needed to be, dancing to the driving guitars and pounding hope of songs about man’s demands and burdens, desires and destiny. Even now, when I hear ‘These Days’, I have to stop and let its brilliance wash over me, Bill Berry’s drumming and Mike Mills’ harmony cutting right to the core of what it means to be alive. A couple years later, R.E.M. returned to Austin, bigger now, supporting the Green album. We got floor seats with friends – my sister with me again – and spent two hours in ecstasy, turned on by ‘Orange Crush’ and a shirtless, long-haired Michael Stipe. Flash forward to the Monster tour; I’d lived overseas and been back twice, felt proud of R.E.M.’s success with ‘Losing My Religion’ if a bit lukewarm about the album itself (not one I go back to much), traveled Europe with Automatic For The People as my soundtrack – an album of such depth and emotion that I challenge you to find a clunker on there – and now returned to school and life in the States. Here I found a tree with similar trimmings – a girl in grad school who wanted to go to the R.E.M. concert too. We swapped music stories and cemented a lifelong friendship while standing in line for tickets too early on a drizzly Saturday morning. We were in to stadium territory now, but the band thrilled us all the same, covering the old and the new and previewing songs from New Adventures in Hi-Fi. New Adventures… was the last album I coveted. Years passed and R.E.M. released records that I’d hear about months after the fact. I bought them and listened a few times, and then tucked them away. It was an inevitable but sad separation, the friend you lose touch with save for a Christmas e-card. 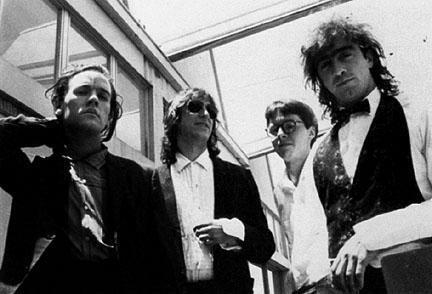 A few years ago, R.E.M. came to Hong Kong – the one and only time they’ve stopped by in all my years living here. I bought tickets straight away, and went along with my husband and my close friend, whose children played with my children. In my third decade of R.E.M. fandom, I was now a wife and mom, but dying to rush the stage and bounce my way through the entire show. I sang all the songs (except for some of the new ones ☺) and basked in the glow of their exceptional talent. When YO has trouble falling asleep, she listens to a playlist of soft songs I compiled to help her relax and drift off. Between Eric Johnson and Dolly Parton is ‘Find The River’ – one of her favorites. The acoustic guitar, piano and a strange instrument called a melodica pair with Stipe’s dreamy lyrics to lull her to sleep like a lazy train rolling over afternoon hills and warm meadows. I hope that she’ll want to hear more as she grows up. If you knew nothing about R.E.M., had never heard their music, and someone played ‘Finest Worksong’ or ‘I Am Superman’ or, better still, ‘Pilgrimage’, you’d be hard pressed to pin down a time and place for those songs. You could easily imagine them as part of today’s sound, somewhere between the shy intellectual pop of The Shins and the southern gothic rock of My Morning Jacket, yet R.E.M. have been around for 30 years. They reached out to us from deep inside the poorly-lit cinderblock structure of college radio, with their indecipherable lyrics, earnest longings and jangly-Byrds’ guitars. From the piney woods and deep red clay of Georgia, they called out to us: we believe in this music, please listen! From the past, present and future, they conquered us. No one sounds quite like them. Still. Always.